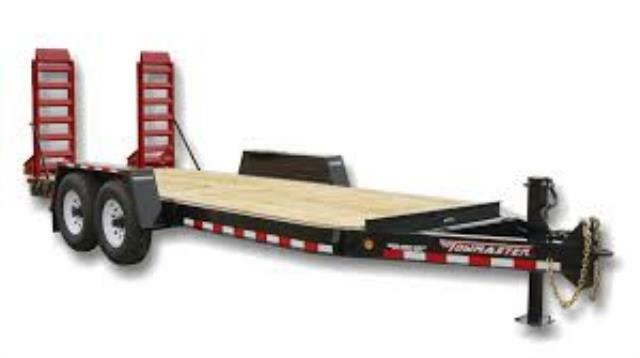 The Towmaster T-12D drop-deck trailer is designed for hauling small to mid-sized equipment. Built on our famous I-beam main frame, this model features an oak wood deck with 2-inch lip, Dexter Torflex rubber torsion axles for a smooth ride, and bolt-on parking jack for easy maintenance. The tongue and main frame is one-piece cold-formed for superior strength and tied together with 3-inch I-beam crossmembers. Spring-assist ramps are standard and the ramps are held in the upright position by their patented Auto-Latch ramp hold-ups. * Please call us with any questions you may have about our towmaster t 12d 18 ft ramp trailer rentals in Dallas and the DFW Metroplex.